The Super Victor p/n 350-2925 is a high performance feature packed small-block racing manifold for standard port location 23-degree cylinder heads. A taller profile with extra long runners that extend into the plenum offers increased volume. The cross-sectional area of the runners are tuned to complement the runner length creating substantial torque increases at 4500-5500 rpm. The Super Victor also has many features that will be appreciated by the serious engine builder, including: Slotted flange bolt holes to allow mating on decked blocks or milled heads. Rear water outlets allow custom cooling system routing. The flange above the intake ports is machined flat to provide a straight-line reference for port-matching layout. A boss for a distributor clamp has been added on the left side, for easier to access when timing an engine. Each runner has a nitrous boss to aid in fogger nozzle installation. Carb pad height = 5.50'' with 0° carb angle. 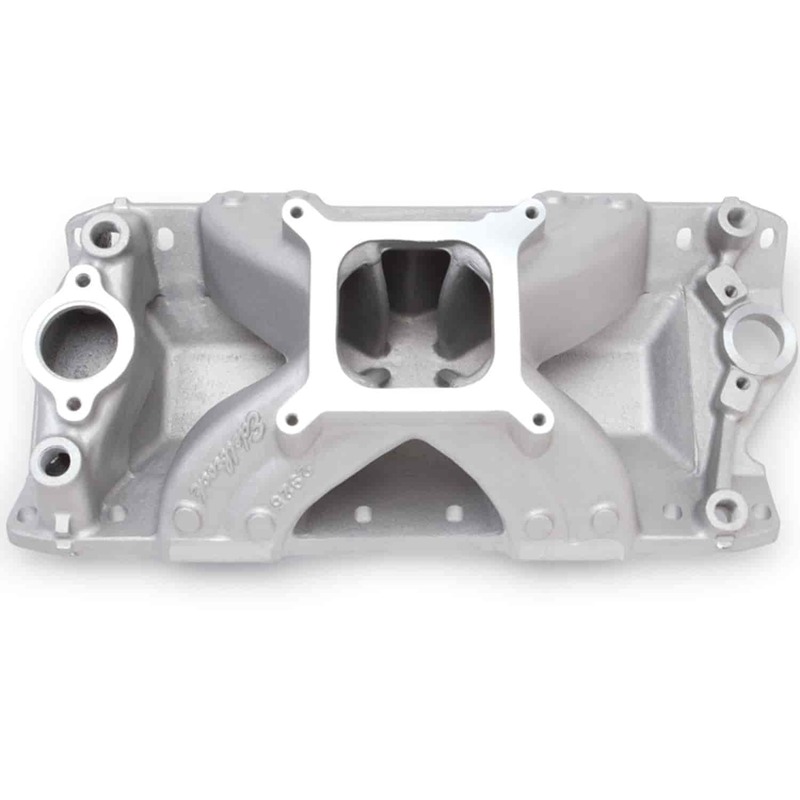 Expertly crafted from cast aluminum these Edelbrock Victor Series Intake Manifolds for Small Block Chevy engines are single-plane, high-rise intakes designed for higher engine speeds and maximum race-winning power! Engineered in conjunction with leading engine builders and racers from all forms of competition these intakes incorporate modern design with the latest racing technology. With such a comprehensive selection of high-performance manifolds, you can choose the best "Victor" to match your carb, cams, and heads for a winning formula of horsepower, torque, and RPM. Victor Jr. manifolds are cast with excess mass in appropriate places for custom port matching. Victor manifolds are available in single and dual carburetor configurations. 2925 is rated 5.0 out of 5 by 1. Will this work with a sbc 421 with a 2800 stall... it's not going to be raced just a hot rod.. Yes, it will work, but is generally used for high RPM applications not for street rod use.